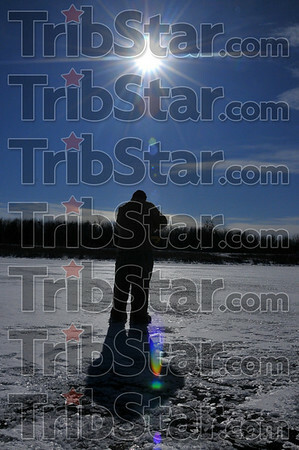 Searching: Mike Street uses a gas powered auger to drill new holes through the ice, searching for the spot in the lake where the fish are gathered. He said when you finally locate the spot, catching can be so good only one fishing pole is needed, the fish are hoked so fast. When searching, each ice fisherman can use up to three rods, searching for the hot spot.